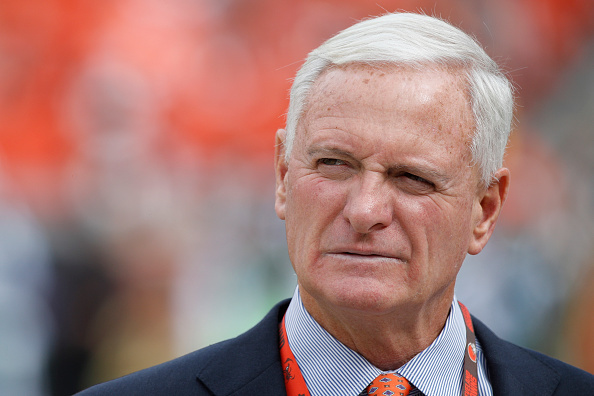 No matter how ugly Sundays get, I truly believe Cleveland Browns owner Jimmy Haslam wants to avoid another round of January firings. Whenever he opens a season preaching consistency and sticking with the plan, I know it’s not just fluff. Haslam no doubt hates his reputation as an owner always ready to clean house, and likely came into Year 2 of this team’s extensive rebuild honestly expecting to keep the status quo at season’s end. Once again, his promise to remain patient has been followed by another dreadful display of football. The Browns have yet to win a game in 2017, with this latest regime now boasting an overall record of 1-24. Naturally, the sloppy results on the field are leading everyone to believe Haslam will once again hit the reset button come January. Typically, when Cleveland’s owner cleans house, everyone is sent packing. However, there are whispers within NFL media that maybe, just maybe, there might be some survivors this time around. However, determining who, if anyone, has a good chance to stick around regardless of how the season ends is anyone’s guess. The reasons why Haslam would tear things down again are pretty clear. Again, we’re talking about a regime which has one win in 25 attempts. Any time the team takes a step forward, it takes ten steps back. Declarations of wins being right around the corner are often scoffed at by fans and media alike. So, sure, it wouldn’t take much work to convince Haslam he needs to hand out another round of pink slips. At the same time, you know he’d love to avoid it if possible. As mentioned, Haslam hardly wants to add another housecleaning to a resume full of them. He also told us two things about this latest rebuild – it was going to take time and would probably be grueling. It’s definitely been the latter, but will Haslam allow the former to come true? If he were to ax this crew after just two years, he’ll receive criticism for not providing enough time to see this plan through. As a result, there remains a chance some staff members stick around no matter how the season ends. Again, though, it’s tough to figure who’d be safe. On the other side, Sashi Brown and the rest front office are still getting laughed at for the AJ McCarron trade fiasco. One would think they’re already on thin ice after reports of Haslam’s wife Dee “going nuclear” on them after this whole ordeal. They’ve also struggled mightily at finding a franchise quarterback, being known more for who they’ve passed up on than who they’ve drafted. As you can see, Haslam would have just cause for sending both parties packing. That said, he’ll likely spend the remaining weeks of the season looking for enough reason to at the very least maintain some sort of consistency. If I had to place my bet on who might survive come January, I’d likely put money on Jackson. This is in no way saying Cleveland’s coach has earned another year. He’s made numerous blunders this season, and the next time he owns up to one without trying to elicit sympathy will be the first. At the same time, Jackson was Haslam’s very first celebrated hire. Until he showed up, everyone the Browns owner brought in was met with skepticism. In Jackson, Haslam found himself a coach fans and media felt was a great hire. Despite the bloom falling off the rose ever since, I still think he’d be hesitant to part with literally the only person he’s acquired who was unanimously seen as a home run. Brown, on the other hand, has been called out frequently for his lack of experience. The former lawyer has been seen as someone who can excel at acquiring draft picks, but not much else. Toss in the aforementioned McCarron incident and you can see how he might draw short straw if Haslam feels compelled to make a move. Things will obviously change as the season carries on. Should the Browns start showing progress, maybe it’ll be enough to allow everyone to hang around for at least one more year. Likewise, a 1-15 season or (god forbid) a winless campaign could result in nobody being spared from the owner’s wrath. Until then, expect Haslam to continue looking for ways to avoid yet another full-scale reset.